12" wide and 131/2" long, laying flat; straps: 1" wide and 22" long. We love a mesh market bag. 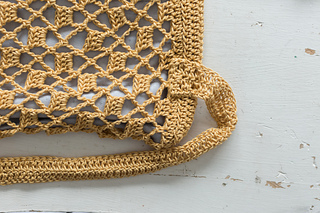 It’s just the right tool for toting so many things, from fresh vegetables to yarn (of course!) to vacation miscellany. But sometimes, it’s not quite the right size, or the handles require more hands than we have. 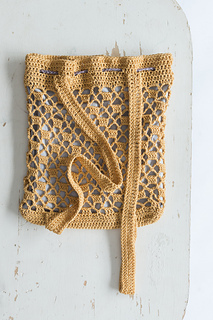 Here we present the pattern for a tote with shoulder straps for hands-free toting. 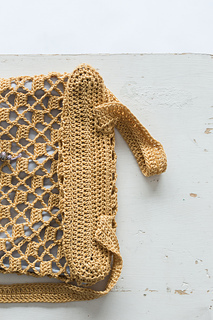 If you’re not quite content with the size given, the pattern includes directions for altering the size to suit you. 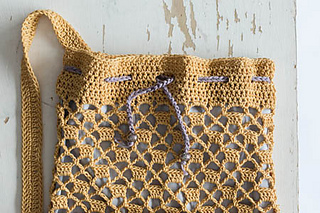 Crochet your bag your way! HOOK Size H/8 (5mm). Adjust hook size if necessary to obtain correct gauge. NOTIONS Yarn needle; 2 beads (with large holes); 1/3 yd cotton lining fabric (optional). GAUGE Two 4-dc groups and ch-5 sps and 10 rows = 4” in patt.